The early bird gets the worm, right? Not exactly. When it comes to spring lawn care, beginning too soon can actually damage the grass. So, how can you know when it’s time to start mowing, fertilizing and watering? 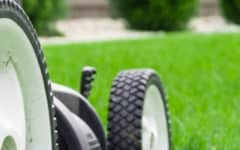 Learn the signs that your lawn is ready for some spring maintenance and grooming. We’ve also provided some tips on how to care for your yard throughout the season. By walking around doing yard work too early, you risk compacting the grass and soil or destroying regrowth before it’s had time to mature. Watering can also do more damage than good if the soil hasn’t yet soaked up the excess winter moisture. Give the sun and soil a few weeks do their job helping the lawn bounce back from the harsh winter season first. 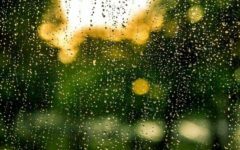 Weather varies from year to year and depends greatly on where you live. So, there is no certain day on the calendar which we can say is the best time to start spring grass maintenance. But there are some signs that you can look for to help decide when to start. The grass and soil should be completely thawed. There shouldn’t be any standing water or muddy areas on the lawn. Average temperatures should be consistently above 40˚ F.
Grass should have started actively growing. In the spring, the regrowth should be noticeably longer and a bright, healthy green color. When it has reached about 2 to 3 inches in length, the grass is ready for the first mow of the season. 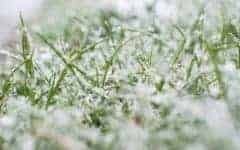 Waiting until this point to start lawn care will help protect the delicate, new grass shoots from damage and safeguard the grass roots from trampling and infection. Grass roots will also grow deeper if they need to reach for moisture; we recommend watering once the weather gets hot and dry later in the spring. 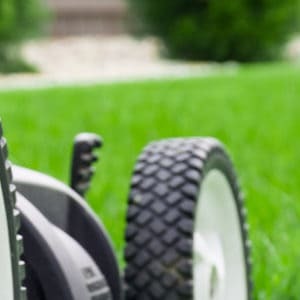 Give your grass what it needs throughout the season with these tips. Clear away dead grass and leaves that have built up over the winter. This layer, known as thatch, tends to mat down the fresh grass underneath. But it also blocks the sunlight and collects moisture which can stunt regrowth and become a breeding ground for mold and pests. Once the soil has dried a bit, a gentle raking in the spring is sufficient for dethatching. Lawns in our part of Pennsylvania might need some extra care in the spring. If you notice some bare patches after you mow it for the first time, address these with grass seed. Water the seed immediately after spreading. Then water it each day for a week following. Wait to mow the turf again until the new seed has reached about 2 inches in height. Hardy grass growth depends on healthy, balanced soil. If the dirt’s pH is too acidic or alkaline, it can make it difficult for the lawn to grow. 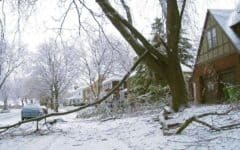 Long, difficult winter seasons can cause the pH levels in your yard to change. To find out what’s going on below the surface, test the soil. You can find soil testing kits at your local hardware or garden supply store. They are inexpensive and effective. Garden centers carry a range of products to neutralize the soil if necessary. If you have doubts, ask your local lawn experts to recommend one for your soil situation. If your yard is prone to weed growth, spring is a good time for prevention. Treat it with herbicides which target the weeds that usually plague your turf. Applying herbicide now will keep them from sprouting and maturing. It will also save you a truck-load of time and backaches during the summer. You might consider retreating the weeds in the fall. Your grass isn’t the only thing that will need some extra attention this season. Here’s how to maintain the other parts of your yard. Cutting back overgrown plants and bushes will help make lawn care easier throughout the spring and summer. You want to make room for new, healthy growth and ensure that other plants are getting the sunlight they need. Also, use this period to get rid of dead branches and plants. The soft spring soil can make edging garden beds an easy job. Create a 2 ½ inch deep trench with a garden shovel then insert a pre-measured length of plastic edging. Edging is helpful for making a barrier between the lawn and garden bed, effectively keeping grass where it belongs. Once the surface of the soil has dried out, you might want to replace the mulch around landscaping, driveways and walkways. Mulch is also an effective tool for preventing weed growth in flower beds during high-growth seasons. Before you get back into the swing of mowing the grass regularly, consider a greener way to care for your yard this year. Kitchen scraps, leaves and grass clippings don’t need to be treated like regular household trash. In reality, closing it in plastic bags and having it shipped off to the landfill is a waste of precious nutrients. Instead, your lawn and garden can benefit from natural compost. And it’s free to make. Grass clippings are full of nitrogen which lawns need and it also speeds up the decomposition process in a compost pile. Learn more about composting. Find more seasonal lawn care advice: 7 Tips for the End of Winter and Early Spring. 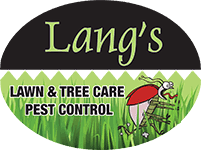 If you want to have more time to spend with your family and do the things you love this spring, call Lang’s Lawn Care. Let us do the dirty work so you can enjoy healthy, green grass and more free time. Call us today at (610) 647-6001 or request a quote online.